This is a situation I see all the time. 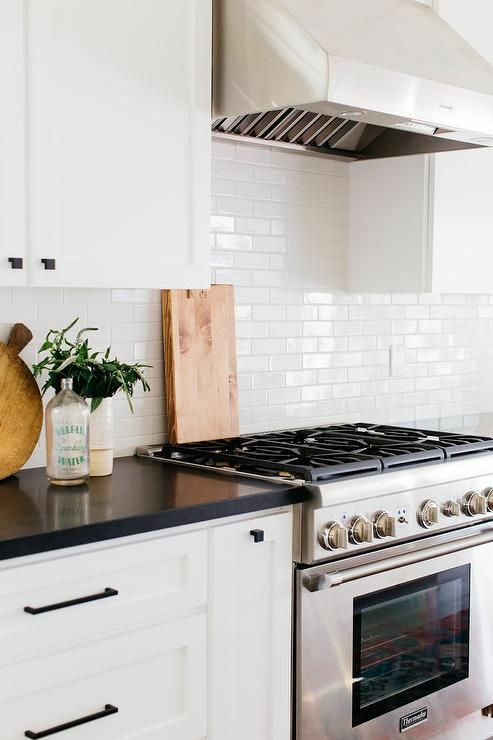 A perfectly timeless and versatile white kitchen with a bossy, earthy backsplash. I’m convinced it’s because most people, when designing a kitchen, make the easy mistake of thinking of the finishes as the final product. And if your kitchen finishes are the end point, well then it seems extremely important to make sure you add something ‘interesting’ when it comes to choosing a backsplash. This is why I see so many odd backsplash choices in otherwise perfectly versatile white kitchens. The backsplash is usually the last to be chosen and installed. And that is where people suddenly feel the need to make a ‘unique’ and ‘creative’ selection. My suggestion is to avoid thinking of the installed finishes like tile, in kitchens, bathrooms and on fireplaces, as the final product. Instead, it’s best to think in terms of creating a fresh and versatile backdrop or CANVAS FOR DECORATING. This is a much better goal. If your home is a timeless canvas, you have endless possibilities for decorating with colour in fabrics and decor. You can make it as serene or interesting as you like. And you can change it up as often as you want. My dear reader Amy sent in an email last summer when I was asking you all for examples of rooms that were bothering you, that you thought might be a case of “clean” colour vs. “dirty”. I am a longtime reader and really look forward to your blog posts. These pictures are of my kitchen/ great room. I’m starting to interview designers to help me divide the space into cozier areas, it’s big but not spacious once sofas & tables are added. The wall color really bothers me, it is a north facing room, the kitchen is on the west side. The yellow cheers it in winter, but fights with the pink of travertine, though it coordinates with the ledgestone on the fireplace. In the photo, the grey-green glass tile inlay seems to just confuse everything. Is this what you speak about clean/dirty on your blog or just fighting undertones? We moved into this house 5 years ago and haven’t changed a thing, in some ways I feel the owner before me had a strong design sense and I didn’t want to mess it up. Now after 5 years, I feel like I am living in someone else’s house. I’m planning some built-ins to the right of the fireplace and extending the wood flooring. I’m wary of more white cabinetry, so probably some color there. I feel like the stone needs to relate to something in the kitchen but it doesn’t. All the white trim is 50% SW marshmallow– so a little orange and it seems to match the cabinetry. The walls are SW Blonde in this room. Amy, your instincts are good. Your kitchen is very pretty and with a few tweaks it will be perfect. You’re right that the earthy stone fireplace and travertine backsplash simply do not work with your fresh black and white kitchen. The glass accent tile is completely unnecessary and clearly the result of assuming the backsplash should add ‘interest’. And as I’ve said often, does anyone ever love an accent tile they inherited? The earthy pink beige travertine is too earthy for your fresh black and white kitchen. This is closely related to the issue of clean and dirty, but it’s more about whites. Your nearly true white cabinets are simply too stark to relate to earthy travertine. A good rule of thumb is that, your backsplash tile needs to relate to your cabinet colour. 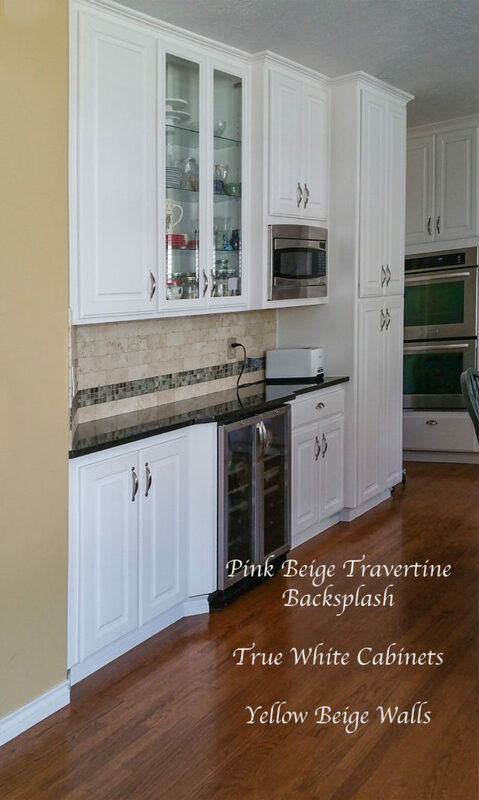 Travertine works with cream cabinets, not white. The black countertop is also part of a fresher look, too fresh to be married to a travertine backsplash. You’re right, there is an undertone conflict between your sunny yellow beige wall colour and your pink beige travertine. Yellow beige always makes pink beige look muddy and dirty. It’s common to see ‘yellow’ or ‘gold’ in pink beige, because all beiges are yellow based neutrals. They need to be compared one to one in order to see their subtle undertone differences (pink, orange, yellow, green, gold). Yellow beige and pink beige are both creamy, yellow based neutrals, but the difference is enough that they don’t play well together. You are right that the earthy ledgestone fireplace does not belong at all, period. It in no way relates to your kitchen. It should be married to a deep brown wood stained kitchen from the Tuscan trend. Not a fresh black and white one. 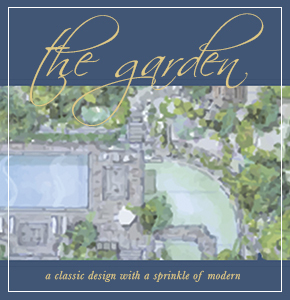 Again an issue of earthy and fresh. The big fix would be to replace the backsplash with white subway tile that matches your cabinets. This will make your kitchen live up to it’s beautiful potential and give you the flexibility to decorate with any colours you want. Replacing a backsplash does not have to be expensive. If you are handy, you may even be able to tackle it yourself. And classic 3″ x 6″ subway tile is not expensive. You can find good options at your local big box store. Since you are considering adding built ins, you may be open to remodelling your fireplace in the process. I recommend a simple, classic white millwork fireplace with a black insert to relate perfectly to your black and white kitchen. Here is a classic black and white fireplace in one of my projects (below). It was designed to coordinate perfectly with the black and white kitchen on the other side of the open concept space. You can use the same white subway tile as your backsplash. Here we used white penny tile instead. Adding millwork to flank your existing earthy stone fireplace will not improve the look in this case. And I don’t recommend that you paint them a colour. Doing that will take it further away from matching your kitchen, not closer. However, with a white fireplace, you could certainly add lots of colour to your mantel and built ins with accessories and styling. With a good decorating plan for your living room, it might work to paint an accent colour on the back of the shelves. Related post: Should Your Great Room Fireplace Relate to the Kitchen? The inexpensive but very effective fix is paint. Did you know you can paint your backsplash? There are SO many kitchens out there that could be tremendously improved with a coat of epoxy primer and the right paint on the backsplash tile. It can look good for many years, or serve as an excellent interim fix. It is often smart to go with the inexpensive fix and reserve room in your budget for new furnishings and decor. Too often homeowners invest all they have in renovation projects, and don’t budget for decorating, which is where all the fun begins, not to mention the look and the feel. The stone fireplace can also be greatly improved with your fresh white kitchen with a coat of paint. I don’t recommend latex paint for stone (although it can work for brick). For stone, chalk paint creates a prettier finish that looks natural and not plastic. You can still add built ins with this super easy solution. Ask Maria: Should I Paint my Stone or Brick Fireplace? This is what will take your kitchen to the next level. While your island countertop looks like the right size for your kitchen (below), the best update here as your footprint does not need a re-design would be to have your island re-built to look like a piece of furniture. I’ve talked about islands here and here. It could even be a wood stained island to add some warmth and interest to your white kitchen. When your island has a pretty, custom look, that’s when you can highlight it with a contrasting colour or finish. Once the conflicts in your finishes are gone, you will have a great canvas for decorating. Depending on what you add with furnishings and decor, you can add some colour on the walls to brighten it up, or you can go with a serene neutral. It’s best to pick out some decor first to get inspiration for the perfect paint colour. 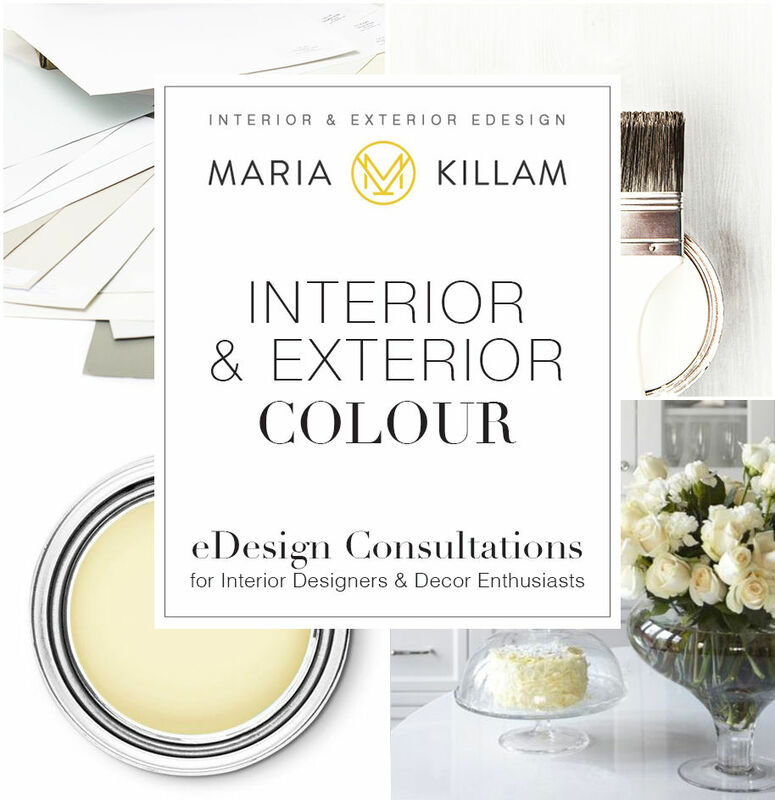 I would love to help you with that with my Get Me Started Decorating eDesign consultation here. Thank you so much Amy for sending in your question and photos! You have a lovely home. I’m always looking for good examples to use for my Ask Maria column. If you have a question about a room that’s bothering you that you haven’t seen covered on the blog, please clean up your room and snap the best photos you can, and email them here. I just finished a fabulous 3 days with 36 True Colour Experts in my SOLD OUT Toronto live workshop! Should You Install Horizontal Tile in Your Home? I’m a long time reader and fan, but this is my first time to comment on a post. We recently purchased a game day condo in the college town where my daughters attend. The condo we purchased was built during the Tuscan phase and needed lots of updating to suit my taste. However, since it is a game day condo, we really didn’t want to sink a lot of time or money into this project. I really hated the dark cabinets and AWFUL backsplash. Since I didn’t want to commit to painting the cabinets just yet, I decided to start with painting the backsplash to help me live with it a while. Well, it turns out the painting the backsplash made such a tremendous difference, that I’m now content to leave the kitchen as-is (to my husband’s delight)! As you know, many people (even decorators) don’t know that you can paint your backsplash. Thanks for sharing this cost-effective fix with your readers! I would love to share a before and after photo, but can’t figure out how to attach them in the comments. The other problem that caught my eye in this kitchen is the statement that the trim is “50% SW Marshmallow.” My paint guy, who seems to have a really good innate eye for this stuff, told me that folks who ask for a color “at 50%” thinking it will merely be “lighter” or “paler” somehow often end up disappointed, because the tinting base has color, too, that is factored into the final formula by the manufacturer to produce “Marshmallow,” for example. Just adding 50% of the pigments skews the proportion of base to pigment and usually throws the color way off. Your posts are always so inspiring! Your suggestions for upgrading the kitchen without breaking the bank was spot on. Such a good suggestion about buying inexpensive subway tile with the possibility of doing it yourself. I also liked the idea of painting the ledgestone with chalk paint for a quick fix. I wish you would write a post on painting over stone a backsplash. I wonder if any readers of your blog have done so and what they experienced. Would you specify paint colors in your edesign consultation? I also wish you would do a post on using chalk paint to paint over stone. I’d love to know what others have done. I’s love to see a before and after. Amazing! and spot on advice. I love the look of painted brick or stone fireplaces, but hadn’t thought that one could paint kitchen backsplash tile as well. Thank you for your post. You explained everything so clearly. I have been reading your blog, e-books, and used your services. I am starting to see the undertones behind the colors! Can’t wait to learn more! Annie, check out epoxy counters on youtube or pinterest. You sound handy and it’s a beautiful fix for your brown granite. You can coat shower walls too. I really appreciate the way you gave the Investment Fix and Effective Quick Fix option!!!! What a great concept. Keep that going please. How encouraging and inspiring to all budgets. As always your posts are helpful and informative. You are spot on. Thank you! 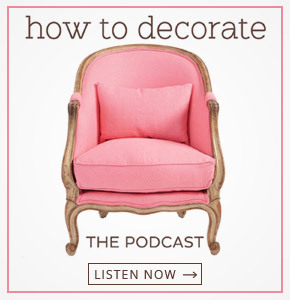 In one post you hit everyone of my residential decorating issues. A house should flow not have the “war of the colors” taking place. I like the idea of them painting their backsplash. I have a question, however, if they don’t want to paint their fireplace would it help to paint the kitchen a blue that coordinates with the fireplace? Very nice solutions to fit any budget, Maria. Personally, I’d go with the paint fixes and use my money on furnishings..although I’d probably have to get rid of the ledge stone fireplace surround completely, but that’s just me. When you suggest changing her kitchen island to look more like furniture, what do you suggest? I thought the curved top was neat. Do you mean the base? Your suggestions are dialed in and spot on. I am rooting for this space to have all the stone bits painted and the island redesigned. It would look amazing!! Oh and Maria, great concise and clear explanation of making your fixed elements goal of a blank canvas, not the final product. That was an excellent post. Not only did you explain the problems clearly, but I loved your options for solutions. Giving homeowners inexpensive options as well as some pricier ones is extremely helpful. Many people would see these problems and just feel dread that they need to undertake a big renovation to fix it, and likely just “live with it” because they don’t feel ready/can’t afford a bigger fix. This post reminds us that there are great interim solutions! Thanks Maria! Maria, I was so excited to see my kitchen featured on your blog. The idea that the walls, cabinets, counters, backsplash, & floors are a canvas should be obvious, but was new to me. The travertine and ledgestone were things we liked about the house, it took me awhile to determine I didn’t like them in the same space. I considered antiquing or chalk painting the cabinets when we moved in but other things got in the way and I’m not a huge fan of the black granite either, so changing the travertine & ledgestone hadn’t even occurred to me. I like the idea of rebuilding the island… I’ve always thought more about using a ceiling treatment to try to bring the space down to scale, the ceilings are 9′– so there’s a lot going on in my head!! I spent a few years fighting my husband to not mount a projector in the middle of the ceiling (I did win that one finally). You’ve given me some logical reasons to consider paint, I gotta say my hearts not in it, at least yet. Alas there is no after yet— so many ideas, so many things I like! Can anyone tell me how to add my avatar photo next to my comments? I can’t seem to find that function. Anyway, I can relate to this reader’s kitchen. My freshly painted walls are a very light grey-beige, I love them. All interior trim and bedroom doors are now new bright white satin sheen with black hardware. I love the contrast. I’m in the process of stripping the varnish off my original 32 year old solid oak cabinets (flat doors, no cathedral, no scroll-work, no hardware, no molding, very modern looking now!) They will remain unfinished for now. I love the look of unfinished wood. We will see how they look after they’ve been touched a million times. I’m using mineral oil mixed with almond extract to clean/lightly polish the cabinets to keep the wood looking alive and beautiful. I have an unfinished oak farmhouse table that’s absolutely stunning with contrasting black chairs. Mineral Oil works wonderfully on that, and it’s food safe, so we’ll see how it works with the vertical surfaces of my kitchen cabinets. What have I got to lose? So this reader’s kitchen has all the colors I’m currently left to deal with..Unfortunately, my kitchen floor is Tuscan light brown vinyl, much like this reader’s backsplash. That will go bye bye! I need to send Maria a photo of my kitchen because I’m struggling with what color to choose for the floor and counters. Remember I’m keeping my kitchen cabinets the light brown unfinished oak. I’d love white quartz countertops. I don’t want black counters. I’m told they show dust very quickly, the same goes for a dark floor. I’ve already got black chairs and stainless steal appliances, I feel a black countertop would be too much black and would go a bit too masculine. Anyway, I’m excited to see Maria help with everyday re-design issues! Oh dear! I’m going to be a real outcast! We put in a new kitchen in 2015. I still don’t have a backsplash. BECAUSE I always had my heart and mind set on brick. (Ducking) The reason it’s not done is because I haven’t been able to resource it. My cabinets are not white. They are cream, BM Linen White. Countertops are soapstone and floors are terra-cotta. I made a 4ft board with white subway to see how it looked and it was awful, just hate it. But, THANK YOU MAria. After Easter weekend, I may paint the cement board like brick and see if it will really work. Other than white subway, I know of nothing else that might work with my kitchen colors. My island is 12’x4′ with a large walnut top.